A landscape of blue mountains. Rising above white clouds and mist. Green. Pristine. Located in the North East of India. With a population of 10,00,000. Spread over half a dozen small towns and numerous villages, all on hilltop ridges. Home to one of the “Lost Tribes of Israel”. And to the man who holds the record for the highest number of wives. Creators of the amazing textile art. Mizoram – the remotest state in North East India. The youngest son inherits all the property while the eldest sons move out of the parent’s house after they get married. The youngest son is expected to stay on and look after the parents in their old age. 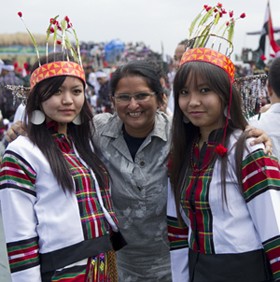 In modern day Mizoram, wills are recognized. Principles of ‘self help’ and cooperation prevail. Under the system called ‘Hnatlang’ the villagers are expected to contribute labour for the welfare of the community. Inter village paths, community halls, water points are constructed & maintained by hnatlang. Under a parallel system the ‘tlawmngaihna’ community services are rendered to people in distress. When anyone goes missing (a not-so-infreqent occurrence given the jungle paths and rough hilly terrain combined with heavy monsoons) search parties are organized as part of the hnatlang. Signals in case of distress are passed on from village to village. This is now instituted and the Young Mizo Association, of which every young Mizo male is a member, carries out the functions of communal social support. Burials, weddings, and any social event in the life of an individual that require people resources that are beyond the reach on an individual and necessitate the involvement of others, are carried out not on a commercial basis but through the effort and support of the YMA. The Zawlbuk or the bachelor’s dormitories are anoter interesting feature of Mizo communities. Every village had a Zawlbuk or a big hall in which all the village bachelors slept at night. Women wee not allowed inside the hall. In the Zawlbuk, young men were trained in life skills such as manly behavior and the Mizo way of life. Tobacco is grown in the jhooms and men, women and children all smoke. Pipes of men and women differ as the women smoke through water, while the men smoke it directly. The nicotine-water from the pipes of the women is preserved and used in mouthfuls by men as a substitute for tobacco smoke especially when they travel. Mizos brew alcohol from rice called ‘zu’. Before their conversion to Christianity, sometimes there would be village feasts in which the entire village population got drunk for days together. The following articles and photo-essays outlining my visit will be put up over the next few weeks. This entry was posted on March 4, 2012 by wovensouls in ARTICLES BY REGION, Culture Kaleidoscope and tagged Aizawl, Asia, Chapchar Kut, costume, cultural, cultural photography, culture, dance, ethnic, fabric, Folk, india, Indian textile, Israel, journey, Judaism, Lai, Lunglei, Lushai, Mara, Mizo, Mizoram, North East India, Northeast India, photo essay, photographer, Photography, Puan, Ten Lost Tribes, textile art, textiles, tradition, travel, Traveller, travelogue, Tribal, tribe, weaving, woven.